If you want to shoot hand loads buy Ruger. If shooting factory jacketed S&W is good. I like my hand loads a little warm and Ruger is much better for that. don't know how much you already know but rugers are good for pushing loads hot, but imo the mechanical feel isn't as nice as smith and wessons. then smiths are a bit the opposite. if you don't plan on heavy loads a lot id probably go smith for the feel of it, or ruger if you do, either super blackhawk or super redhawk. I like the 9.5" SRH cause I can get a lot of power with good accuracy and low recoil, the downside is its massive but if you don't carry it around much it don't matter. don't know much about other common store brands maybe Taurus but they never felt good from the bit ive seen them. Get a 6.5” Smith 629 classic hunter model and don’t look back. They’re not as fragile as everyone makes them seem. This is coming from a Ruger lover. Second would be an older Redhawk Hunter so you can scope it if desired. Ruger Super Redhawk. It comes with rings, too and shoots quite well. I have S&W and Ruger .44 Mags. They both are solid shooters. I’d suggest that you shop around and find several of each to see if something “speaks” to you. Don't think you could go wrong with either. Had a one of five thousand sw's that i ran a heck ofa lot of very hot loads through with out a hitch.unfortunately it was stolen and i have missed it ever since. 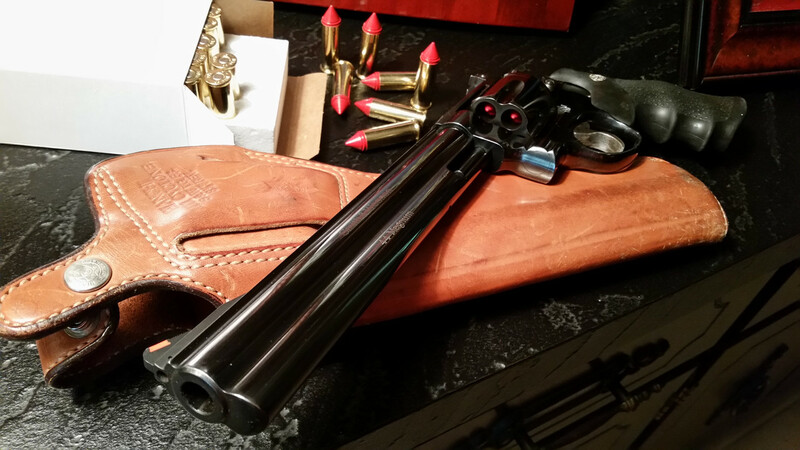 My ruger super black hawk is built like a tank but just doesn't feel as nice as the smith. Both shoot great or at least the sw used to. my first question is, whats your budget? I got a 629 Classic 5" that's loads of fun to shoot. But I prefer the 629-6 with 4" tube much better for reasons I cant explain. I prefer the Pachmayr finger grips over factory grips also. Good Judgment comes from Experience, Experience comes from Bad Judgment ! S&W has the trigger. I like the 6" half lug. Super redhawks here. They take what you give them. This one's been working for me in all venues. Is that the Dirty Harry gun? Nice. The regular Blackhawk in 4-5/8". Not the Super B for me. A 5" S&W m29 would also serve very nicely. I would shoot .44 Special loads in them mostly. I own a shoot both Ruger and S&W 44 mags. My go to is the 4" 629. One really can't go wrong with either brand. 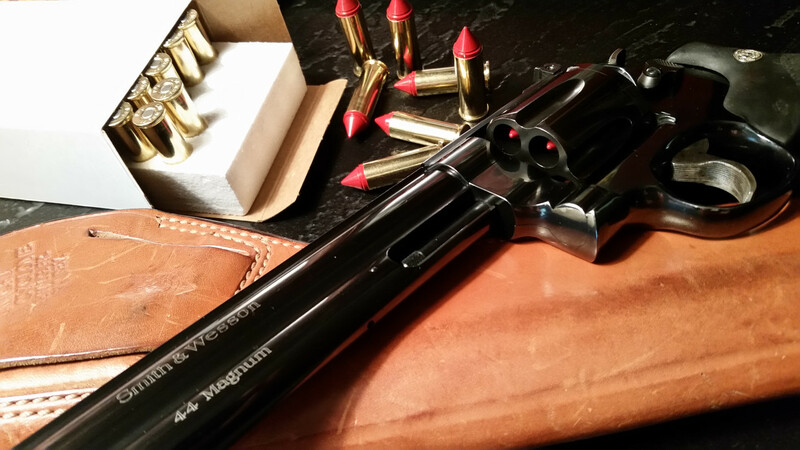 My 629 handles hot loads just fine (just don't try to turn your 44 mag into a 444 Marlin), and has one of the best triggers of any gun I've ever fired. It's stupidly accurate and is an absolute joy to shoot. No, the dirty harry gun did not have the full length lug under barrel, and also came with wood grips. This baby is dead on at one hundred yards. This model which is the "29 Classic" was I think only made and offered for a very short time back in the early 1990's. The rear sight is removable if a scope is wanted. It is tapped and drilled for a factory scope base.